HydroRail-S allows you to easily upgrade a standard fixed showerhead to a spa-like showering experience with luxurious showerhead and handshower functionality. It's designed to accommodate a wide array of bath/shower configurations without altering in-wall plumbing, making it suitable for both remodels and new construction. 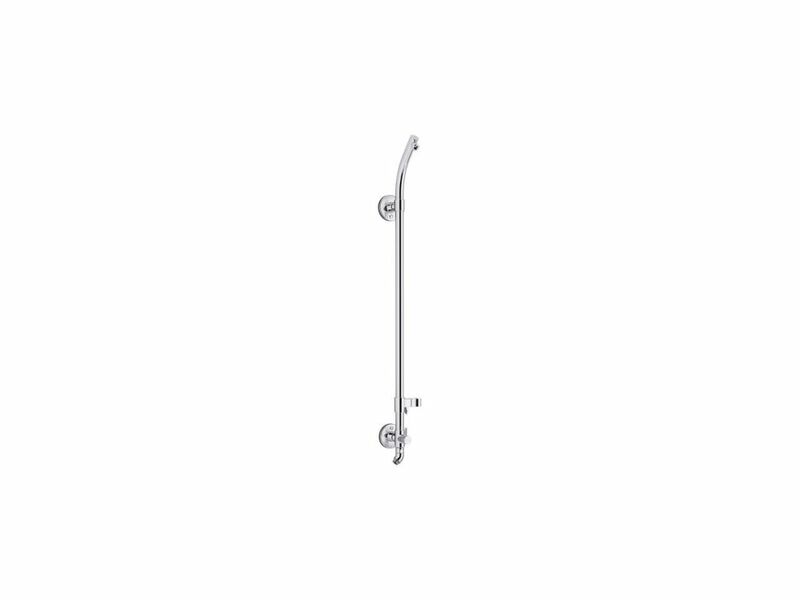 This bath/shower column converts your single-outlet showerhead into a two-outlet custom showering experience, and has a slidebar bracket for easy height and angle adjustments to your handshower. For smooth toggling between handshower and showerhead functions, this column features a diverter conveniently located at the base of the column. Column lets you customize your shower with a showerhead and handshower. Includes column/slidebar and handshower bracket. Showerhead, handshower, and shower hose are sold separately to allow for customized decor and functionality. For use in bath and shower installations. Patent-pending technology allows for an easy bath/shower installation. American Standard - Style That Works Better.Durable, Reliable, Quality Engineering and Construction. American Standard Products are designed for your busy lifestyle. Parts, Hardware, and Components are engineered to enhance the usage of your American Standard Products. Also available in store by special order only see store for details. At American Standard we have a broad range of bath and kitchen products that are designed to marry style and function with innovative solutions, creating products that simply make life easier. Every product we make is designed to meet the unique needs of our consumers and trade partners all over the world. At American Standard, innovation never stops, ingenuity never ceases, history never dates itself and needs never go unfulfilled. Also available in store by special order only see store for details. Create a look all your own with the Artifacts collection. Timeless and classic in its inspiration, Artifacts allows you to coordinate faucets, accessories, showering, and finishes to express your personal style. Artifacts faucets combine quality craftsmanship with artisan designs to lend character and authenticity to your space - as a finishing touch or the central piece to build the room around. This Victorian-inspired bathroom sink spout features an elegant column design. With a fun, innovative design and four different spray types, Flipside delivers a unique and indulgent showering experience. This Flipside multifunction handshower features an elegant, contemporary style and advanced ergonomics for easy operation. By flipping the sprayhead on its axis, you can seamlessly switch between four distinct spray types: an enveloping coverage spray, a dense and soft spray, an exhilarating circular spray, or a targeted massage spray. Hydrorail-S Bath/Shower Column In Polished Chrome HydroRail-S allows you to easily upgrade a standard fixed showerhead to a spa-like showering experience with luxurious showerhead and handshower functionality. It's designed to accommodate a wide array of bath/shower configurations without altering in-wall plumbing, making it suitable for both remodels and new construction. This bath/shower column converts your single-outlet showerhead into a two-outlet custom showering experience, and has a slidebar bracket for easy height and angle adjustments to your handshower. For smooth toggling between handshower and showerhead functions, this column features a diverter conveniently located at the base of the column. Hydrorail-S Bath/Shower Column In Polished Chrome is rated 4.8 out of 5 by 6. Rated 5 out of 5 by GM from Exactly what i wanted. Exactly what i wanted.